Most existing applications operate with data that must be stored and loaded in different times and different locations. The data is stored in text or binary files with a well defined format. Initially, in the first version 1.0, an application operates with data structures that can be stored and loaded. But, next version (2.0) these data structures suffers changes. Some structure’s attributes are added and other could be removed. These things change files format and structure when a new file version is saved. Question: What happens when you are using an application version 2.0 and you are trying to load old files format (version 1.0)? Answer: Most cases should cause incompatibility troubles between the current new application and files in old format. This could throw exceptions and the application could have undefined behavior. That’s why the application must be written in order to be able to open both file versions. In order to solve the compatibility issue exist many solutions, more or less professional. The recommended solution is the serialization. The serialization is a write / read object process to/from a persistent storage. Serialization it’s a good choice in order to maintain a good data structure. Many different frameworks offer serialization support. One of these is Microsoft Foundation Classes – MFC. If we want to use MFC serialization support, we can use a CArchive instance. This object, combined with a CFile instance provides a strong mechanism for objects serialization. Because, in different applications version, the file suffers significant structure changes we have to use MFC’s serialization concept called Versionable Schema. Versionable Schema means the using of CArchive class methods GetObjectSchema() and SetObjectSchema() and a constant VERSIONABLE_SCHEMA (that you can find it in afx.h file and has 0x80000000 value) combined with a OR LOGIC operator and the last application version number as a parameter of IMPLEMENT_SERIAL macro. The GetObjectSchema() method is used in order to detect stored objects version from a file that is loaded in our application. The complement of this method, SetObjectSchema() method, allow us to save the objects version. Different by the C++ I/O standard streams, the CArchive class is special designed only for objects serialization in binary files. 1. The class that we want to serialize has to be derived from the abstract class CObject (or other classes derived from CObject). 2. Overwrite CObject’s Serialize() method. 3. Use DECLARE_SERIAL macro in your class declaration. 4. The serializable class has to have a default constructor, without arguments. 5. Use IMPLEMENT_SERIAL macro in the implementation file of serializable class. More information you can find it here and in links of this page. But, from these steps until to a complete serialization and versionable application there are few significant steps to follow. Next, I will present to you a Dialog base sample application that supports serialization and is versionable. Next, I will present to you how you can create an address book application (based on a MFC Dialog application architecture). Suppose that initially our client requested us an address book that contaions: name, prename, address and phone number. But, once with the mobile phone and Internet area extensions our client needs two new fields for mobile phone number and for email address. Because this is a demo application I kept on my window the possibility to save both version, using two radio buttons. A good application design helps us if we have new requirements and we have to change the application structure. The code changes have to be done without too many code interactions. Ideally, with add code only. 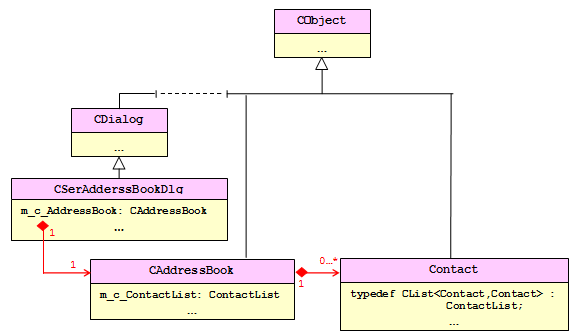 Although Contact class and CAddressBook class are serializable, the objects serialization is implemented into Contact class. The last line represents an “alias” definition for a MFC list definition, used in order to store displayed data. This list is using for Contact object administration. In the implementation file we declare the IMPLEMENT_SERIAL macro and we are initializing the static variable with our current application version. Into this declaration you can observe the VERSIOABLE_SCHEMA constant combined on OR logic with 2 (my demo application last version). This, the third macro argument is essential for objects versioning, combined with CArchive::GetObjectSchema() and CArchive::SetObjectSchema(). More details about this constant and it using process or about these methods you can find here. If CArchive constructor sets store-load flag on CArchive::store (save to file) then the code flow will follow true if’s block and objects data is sending to archive and stored in the file (including file version, too). When we want to open an existing file, our CArchive’s constructor receives CArcuhive::load flag and enter to else if’s block of Serialize(). Is extracting file version, and after that is loading all Contact objects. 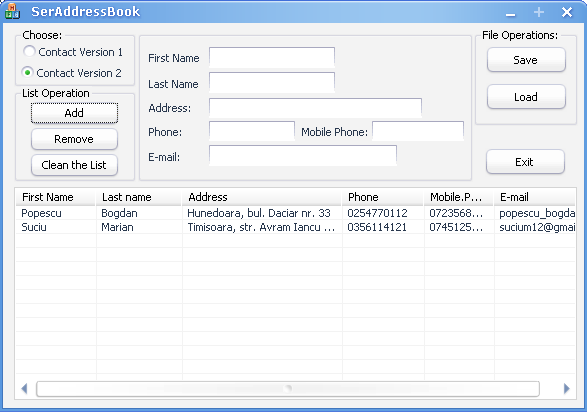 CAddressBook class make the link between interface dialog class (CSerAddressBookDlg) and the serialized class Contact. This class contains a Contact objects list. CAddressBook class is administrating this contact list and is realizing load/store object. Into this declaration you can see the existence of a contact list instance (m_cContactsList). This class contains add, update or remove contact methods. Because our class has to be a serialized method we have to overwrite Serialize() method, the method has to me used by the client class ( in our case the interface class – CSerAddressBookDlg). Then, into a while loop I’m iterating over the contact list. I am serializing the data and I’m storing to my new file. Once we have implemented this serialization mechanism the using of this one into our application became very easy. As you can see, I have a CFile object that I’m using it, combined with a CArchive instance, for data storing to a file. Although my local CArchive instance receive as a first parameter the address of the file handler and the store flag CArchive::store. Next I call CAddressBook::Serialize() method and I’m closing the store operation. As you can see, I am creating a local CFile object, needed for reading operation. Although, I’m creating a local CArchive instance that received as constructor parameter the file handler address with CArchive::load flag. Then, I’m calling CAddressBook::Serialize() method. Is entering on else branch and finally we are disconnected the object from file. The last line contains PopulateList() call and is my populate list method. It populates my list control (a CListCtrl instance) with the file loaded data in order to display it into our dialog. The MFC’s Document View architecture offers complete serialization support. Each MDI/SDI application contains default serialization support. 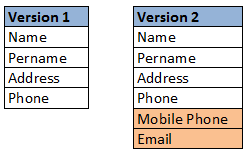 My demo solution presented is an adapted serialization version for dialog base applications.